Take a look back at RetinaLyze's 2017 — and get a peek at the future of eye screening and RetinaLyze in 2018. So we thought we’d take a moment to step back and review it all — plus offer a few glimpses of the future of RetinaLyze. Version 2.0.1, launched on May 7th 2017, introduced the Image Quality Assessment Tool (IMQAT in short), which analyzes the quality of a fundus photo and determines if the quality is acceptable for grading or not. The feature was mainly launched to support training of new fundus camera operators in understanding the importance of photo quality to achieve reliable results. The feature was tested on 148.123 photos and about 3% of the photos were tested positive for bad quality with the IMQAT feature. We manually inspected all positive results (bad images) and found a PPV (Positive Predictive Value) of 100%. Putting it differently not one of the images found by the feature was wrongly classified as a bad photo. We're proud of this assistive feature, which we are continuously improving for more use cases. ‍The RetinaLyze algorithms can now be accessed through and integrated into other software and hardware. One big launch this year was the RetinaLyze API, which was launched August 15th 2017. The service delivers a simple analysis to the end-user without other information than the result, which can be integrated into any internet-enabled software or hardware. The RetinaLyze API is basically a standardized way for other programs or devices to communicate directly with the RetinaLyze algorithm. The RetinaLyze API makes it possible for a third-party to create eye-screening software or add automated screening of retinal images as added functionality in their existing/new software or device. "We've always known that great algorithms only get better if they are easily accessible." - Ganesh Ram, CCO at RetinaLyze System A/S. Accessibility in terms of ease-of-use, a non-steep learning curve and speed-of-use is highly important. 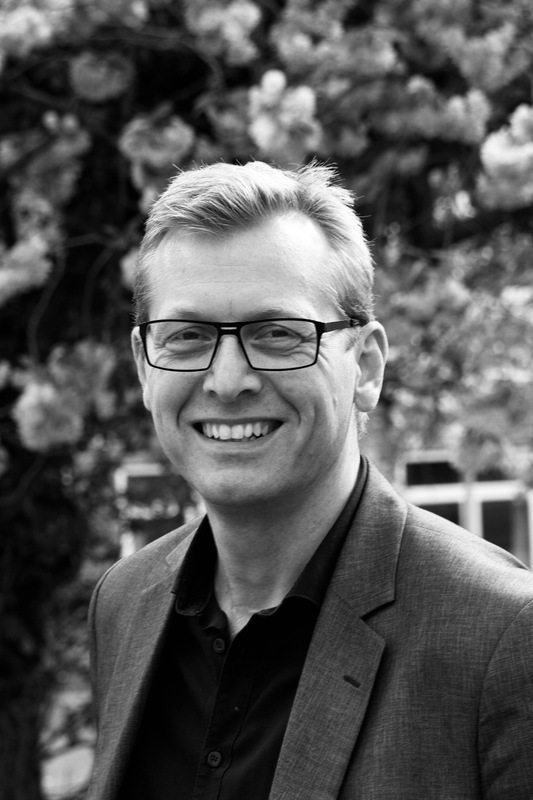 However eye care professionals are working with an increasing number of tools and software suites in their existing workflow, which increase the complexity of their workday. 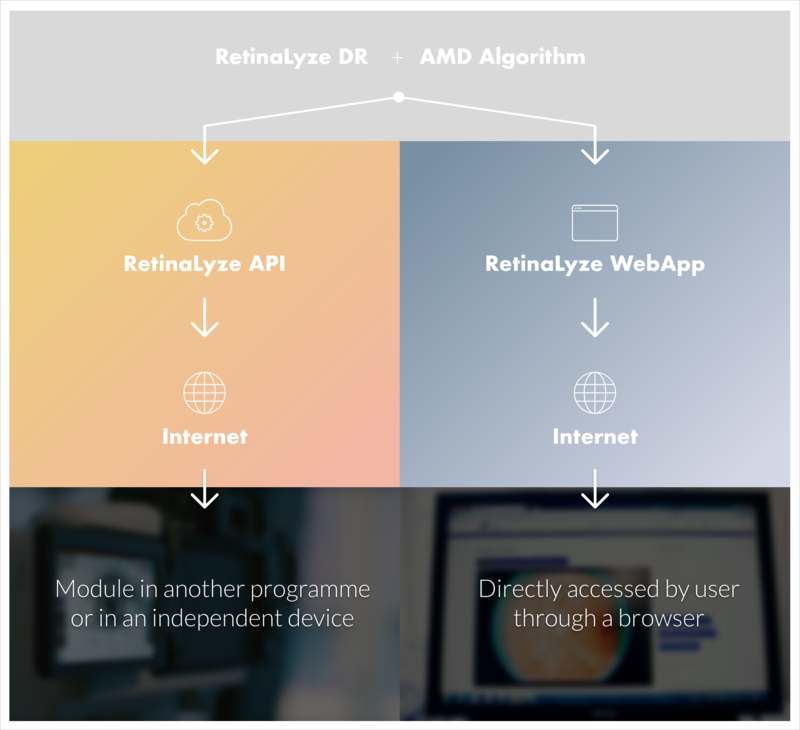 Our aim with the RetinaLyze API is to be present in the software and hardware, which is already familiar for the eye care professionals in order to increase efficiency through automation while simplifying the existing workflow. The main target groups are third parties interested in providing automated retinal screenings to their clients. Our development team has been working hard this year to improve the eye screening workflow. Below are a few smaller optimizations and enhancement we've released this year. We enabled DICOM-support in August 2017 and now support the two major file type standards in medical imagery (.jpg and DICOM). We chose to enable the Printable PDF report with Results and Recommended Next Steps from both the automated algorithms and the Eye-specialist Backup for all users as a free feature in February 2017. It is now also possible to add your own logo and clinic/shop information to the report. The Eye-specialist Backup communication platform received a major overhaul to enable the operator to send all relevant information about the patient to the ESB for a manual assessment. The Search Across Chain feature was released enabling a single clinic or retail store to search for images and results across entire chain. This enables them to locate the patient's/customer's prior history from other locations. The Statistics feature received several speed improvements as well as features to enable administrators and users to view and download statistics in real-time. We launched a new website and a Knowledge Base for all users this year. 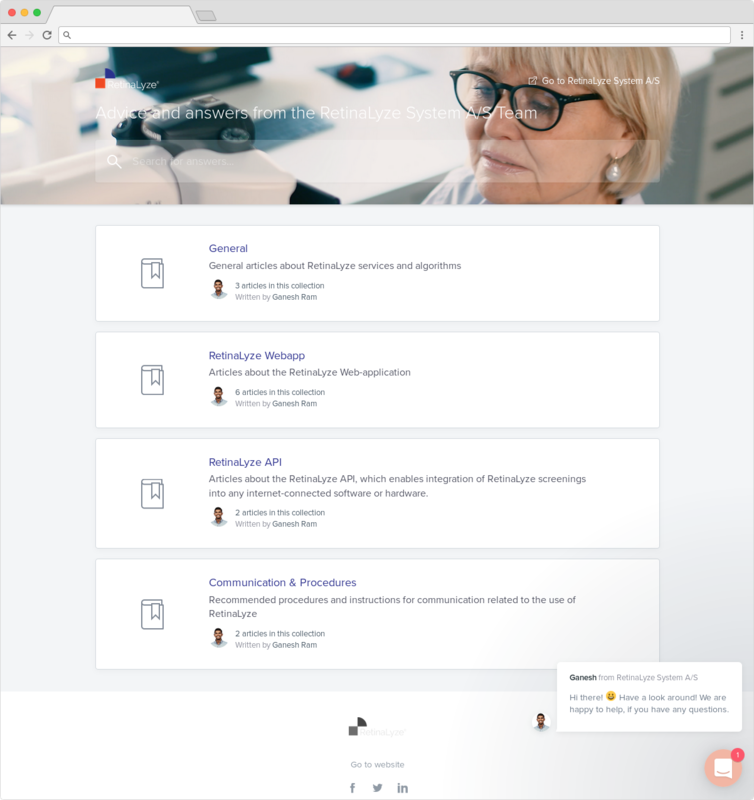 The goal of the Knowledge base is for it to contain everything you need to know -- and do -- to get started with your RetinaLyze account. We'll provide guides for setting up the software for your needs, guidelines to follow and tips & tricks to set yourself up for lasting success. We're starting of with the basics with Getting Started and Communication articles, but more articles about eye diseases and fundus images will also follow. Feel free to visit the Knowledge Bank and also feel free to request an article using our email: support@retinalyze.com. RetinaLyze Glaucoma will be launching in early 2018. Stay tuned for updates! Make eye screenings faster, easier, and more scalable to perform: such as speed optimizations, workflow optimizations and results that are easy to understand. Improve our integration with comparable platforms: such as integration with PACS, EHR/EMR systems and fundus related hardware. Improve our security in accordance with changing legislation: such as improving security of data transmission and storage in accordance with EU GPDR and HIPAA. Automated screening for new eye diseases: such as screening for signs of Glaucoma using fundus images. We’re incredibly excited to forge ahead with all these improvements, and will keep you all posted as the year unfolds. Since July 2015, we've screened over 150.000 people using our automated algorithms and tele-medicine services. We and our customers have referred over 5800 people with undetected eye diseases, including roughly 2.300 cases of Age-related Macula Degeneration, 750 cases of Diabetic Retinopathy and 1000 cases of Glaucoma. 4400 people had severe eye conditions which lead to blindness if they go untreated, while 400 people had life-threatening and/or acute conditions which needed immediate diagnosis and treatment. While these are startling numbers, we are excited to be a part of the eye screening community and will continue our efforts in saving vision. "The last few years have been incredible. We started the company in December 2013 based on an idea and a mission to prevent blindness using Artificial Intelligence. Since then, we've been helping eye care professionals around the world increase their efficiency in eye screening and made eye screening more accessible to both receive and perform. We helped optometrists take the step into providing eye health services, participated in several eye screening camps in Africa, won an award for our efforts in entrepreneurship and even opened our own clinic in Kenya. We are fortunate to be working with competent distribution partners in over 30 countries and are happy to see several industry partners joining us in the fight against preventable blindness. We will continue to make eye screenings faster, easier and more accessible to receive and perform. We will continue to work with the established health care sector, retail partners, industry partners, NGOs and Base-of-Pyramid programs to increase the awareness of eye diseases and increase the availability of eye screenings around the world. We will continue to improve our algorithms and tools for eye care professionals to aid them in the fight against preventable blindness." Above all else: Thank you! We love what we do, of course, but none of it would mean a thing if not for all of you. The fact that you find RetinaLyze useful and powerful for your needs makes our work meaningful. So again: thank you. Thank you for using RetinaLyze. Thank you for making 2017 amazing. And thank you for exploring the future of eye screening with us. Happy new year!